ERP systems have been the backbone for organizations all over the world since time immemorial. They are one of the most important and critical systems used for everything from day-to-day business management to complex decision making. According to Gartner, the worldwide ERP software market was $25.4B in 2013, up 3.8% from $24.4B in 2012, and no prices for guessing the market leader – SAP. SAP, in 2013, retained its market leadership position (capturing 24% of the market share) selling $6.1B in ERP software with Oracle trailing behind with $3.1B (12%) in sales (Gartner). SAP’s ERP product portfolio includes SAP S/4HANA, SAP Business All-in-One, SAP Business ByDesign, SAP Business One, SAP ERP, and SAP R/3 – each unique in their offering and target audience. After working with a number of Microsoft Dynamics ERP customers and seeing them benefit greatly from integrated eCommerce systems we have decided to leverage our experience to extend the same benefit to the SAP ERP customers. We at i95Dev are happy to announce another new addition (also see our recently unveiled our Magento Sage 100 Connect) to our product portfolio Magento SAP Business One Connect. Why SAP Business One (SAP B1)? 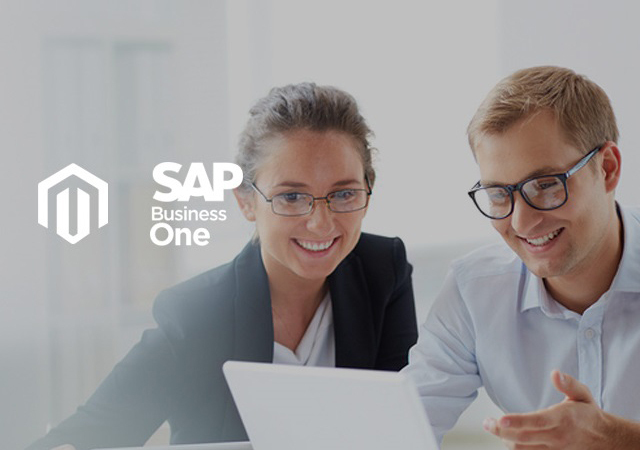 SAP Business One ERP system is designed to help small and mid-size businesses better manage every aspect of their company – from sales and customer relationships to financials and operations. The system designed to grow with you is trusted by over 47,000 companies in 150 countries. SAP Business One is available both on-premise and on-demand. SAP Business One’s starter package can even get businesses started in as little as three days. The most popular and feature rich eCommerce cart, Magento is adopted by more than 240,000 merchants all over the world. Owned by eBay, Magento currently has a market share of nearly 30% (an analysis of Alexa top 1 million sites). Magento caters to businesses of all sizes and is known for its flexibility and community support. There is a strong business case for Magento and SAP Business One integration – with Magento and SAP Business One integration businesses can not only benefit from the traditional eCommerce and ERP integration but also leverage the customer relationship management module of SAP Business One and reap all the benefits of an eCommerce and CRM integration. Customers – The Magento SAP Business One connector syncs all customer related information like contact information, shipping and billing addresses and more, between the two systems. The centralized integration enables businesses to create self-service customer portals for improved customer relationship. Orders – Grow faster by automating your order fulfillment process with Magento and SAP Business One integration. The orders now can be seamlessly transferred from your Magento eCommerce to SAP Business One system without any manual intervention. Product/ Items – Now manage all your complex product information like description, attributes, prices, categories, images and more from a single system. Inventory – Better manage inventory and avoid overselling your products with inventory information sync between SAP Business One and Magento eCommerce systems. Invoices, Shipping & Payments – The seamless information sync is not only a blessing for your customers but also for your accounting and fulfillment department. While shipping information sync keeps your customers informed of the order status, invoices and payment information sync streamlines your accounting books. Magento eCommerce and SAP Business One integration is only the beginning of what is possible with these two systems; laying the foundation for what is soon to follow – the world of omni-channel commerce. Imagine businesses with SAP Business One systems consolidating orders from multiple channels like eCommerce, mobile, social media and online marketplaces like eBay/ Amazon without significantly increasing their costs and operational overheads. eCommerce Growth Engine for SAP Business One systems is not very far away. Do you have a SAP Business One ERP system? Interested in exploring the world of integrated eCommerce? Contact i95Dev today. We guarantee you, Magneto eCommerce integrated with your SAP Business One ERP system will revolutionize the way you did your businesses.